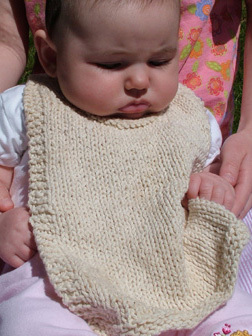 List of baby bib knitting patterns that are quick and easy. 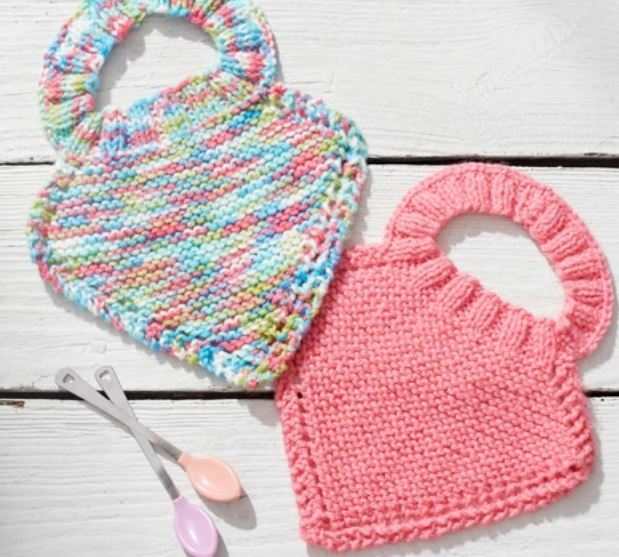 Baby bibs are quicker to knit than baby blankets or baby cardigans. 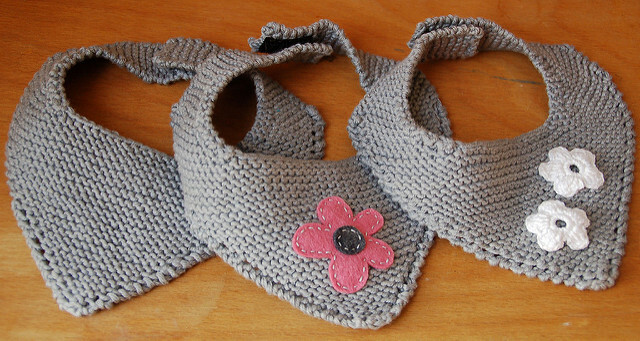 So if I am short of time when knitting a baby gift, I’ll consider a set of baby bibs. 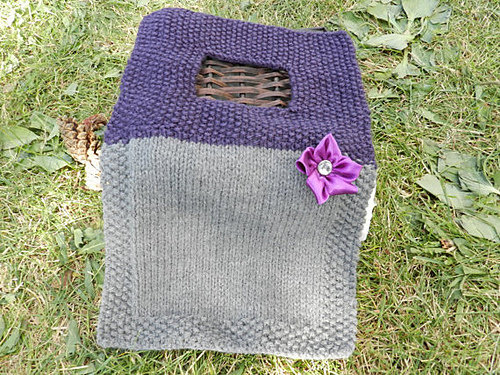 This pattern consists of mostly stockinette stitch with a garter border. Need to know how to cast on, knit, purl, increases, decreases, short rows, i-cord and applied i-cord. According to the designer Laura, the short rows makes it easier to knit and provide a more finished look. She provided some brief instructions for making short rows, hopefully making it unnecessary to spend more time finding instructions elsewhere. The garter stitch border not only look nice, it is to prevent curling because stockinette stitch likes to curl. So, the garter border is compulsory. This crescent-shaped bib is worked in segments. Start by casting on for the garter stitch border. Stitches are then divided into seven segments. The decreases are worked at the edges of each segment, bringing each one to a point at the neck. I think the instructions are straightforward enough. Let see how it goes. Certainly worth a try for me. I really like this triangle-shaped bib. It looks more like a cowboy’s handkerchief rather than a bib. I think that’s what the designer was aiming for. 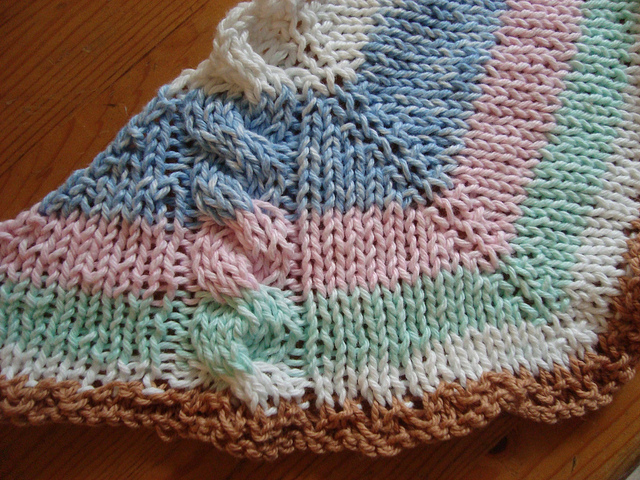 Knitted in garter stitch, the bib is a squishy flat piece of knitted work. Need to know how to do increases in garter stitch. It is not difficult and may even be addictive. Need to know how to rejoin yarn for the shaping of the bib. 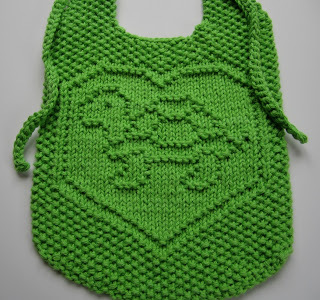 This Turtle Love bib features a seed or moss stitch border with a cute turtle silhouette knitted in purl stitches against a stockinette background. Elaine gave very detailed instructions. She provides 2 ways to cast on and 2 ways to make the cords. She also created a chart for the turtle design. The pattern is available free at Elaine’s website. Elaine has many other bib patterns on her website. Do check them out. 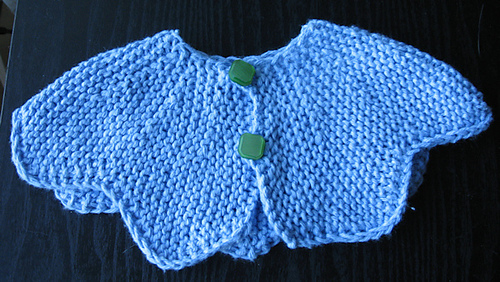 The Big Baby Bib is a free pattern by Willow Yarns using their Sudsy Yarn. 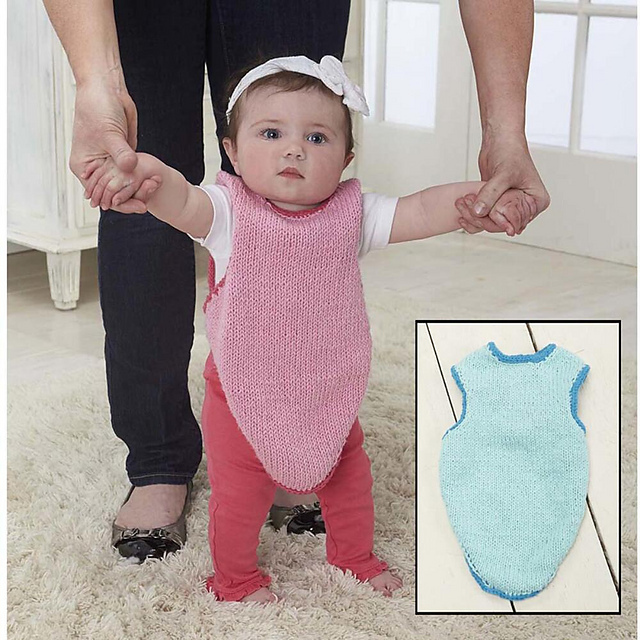 It is an oversized bib that covers the entire front of the child. It is knitted from the bottom up with arm shaping and dividing for the neck. Need to know how to do an attached i-cord. This is not a beginner’s pattern. April’s bib pattern is similar to the Big Baby Bib. It should fit a baby for about the first year. The straps can be closed with button and a button-hole or velcro for closure. This bluebell bib is knitting sideways using short rows. The designer uses the wrapped stitch as an increase. I am not familiar with this knit-the-wrapped-stitch technique. Read the pattern carefully or try it out first. This pattern is not professionally written but I like the idea of a flower-shaped bib so, I am keeping this. The blank canvas bib is an unusually shaped bib. It really is like a blank canvas where you can exercise your creativity to embellish it. It has no buttons or straps. Size available for 6 months to 3 years old. Knitted from the neck down using seed stitch, the neck opening is created by binding off and casting on. The pattern is not professionally written but it is fairly systematic. Designed by Diandra Jurkic-Walls, this bib is actually more like a rectangular scarf in baby size. It features a single cable and a garter stitch edging. It works well with variegated yarns. 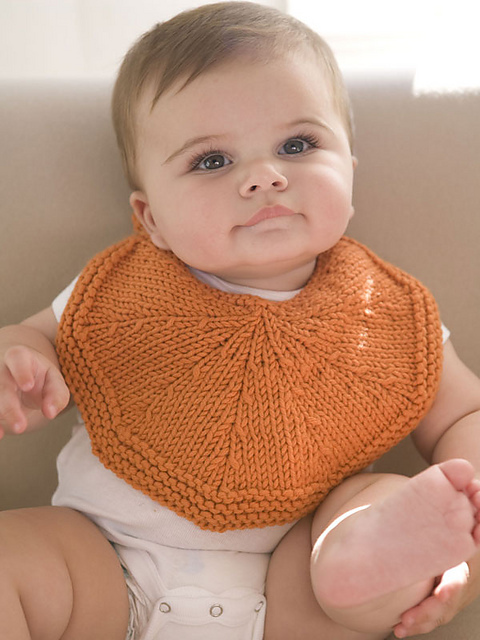 This is one of the more stylish and less babyish bib patterns I have come across so far. Hmm, just because you are a baby doesn’t mean you can’t dress in style, drool and all. These 2 baby bibs are designed by Rebecca J Venton for Red Heart. Cast on for the 2×2 ribbed neckband before casting off two-third and continue knitting for the bib itself. I like this bib pattern because it doesn’t require any fastening like i-cord, or velcro. Just pop the stretchy neckband over the baby’s head. Rebecca recommends using Red Heart’s Baby Hugs yarn because it has very pretty colourways and is made with premium acrylic. 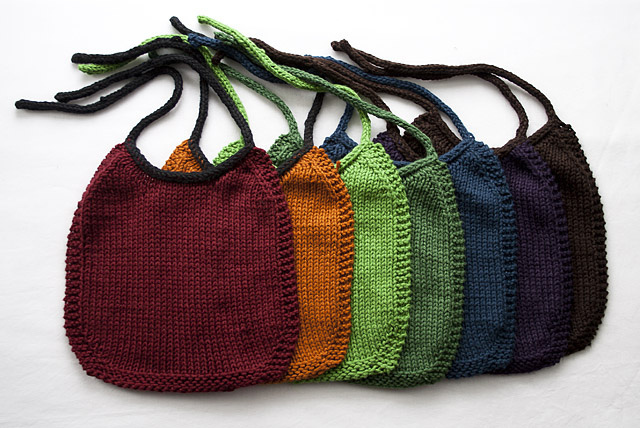 If you like this list, you might also like my knitted baby vest pattern list.